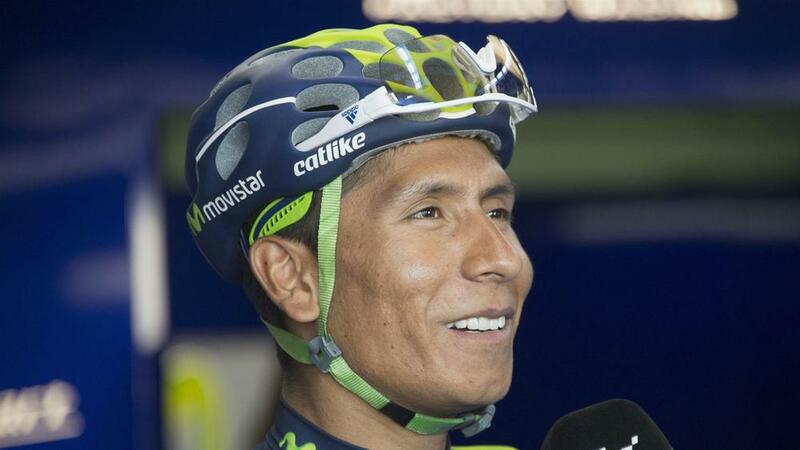 Nairo Quintana charged to top of the Giro d'Italia general classification on Sunday after an accident with a stray police motorbike ended the hopes of Geraint Thomas and Adam Yates. Quintana showed his supreme climbing skills on the gruelling ascent of Blockhaus on stage nine as he powered away from the peloton, with only Vincenzo Nibali and Thibaut Pinot able to stay close. The Colombian broke with seven kilometres remaining and took Nibali and Pinot with him, but they had no response when the 2014 champion kicked again. As the gradients grew over 10 per cent Quintana pushed for home and the pink jersey, the Movistar rider opening up a 28-second lead over Pinot, with Tom Dumoulin third after finishing strongly. His pre-race rivals for the GC are well adrift after Thomas and Yates were involved in a big crash with 13km to go, the British pair left lying on the tarmac after being wiped out by Wilco Kelderman. There was little the Team Sunweb rider could do to avoid it, though, after clipping a poorly parked police motorbike, with Kelderman falling and taking the GC contenders with him. Both Yates and Thomas were able to resume the race, but they face an uphill struggle to reel Quintana in now, while Team Sky's other GC hope Mikel Landa is also adrift following the crash. Quintana was undoubtedly the big winner on Sunday as he pulled clear of all of his rivals, albeit with the help of the motorbike's intervention, while Nibali is still well placed to retain his title. The mood in Movistar may be high, but it will be very different at Team Sky with Thomas' accident, the Welshman falling well down the GC having been second ahead of the stage. Former race leader Bob Jungels also suffered on the final climb as the Quick-Step Floors rider gave up the pink jersey after finishing over three minutes behind Quintana. Thomas and Yates will have a rest day on Monday to consider their options, the British duo getting much-needed time to rest their weary and battered limbs ahead of stage 10 on Tuesday. Given their deficits they could abandon the race, but should they return to the road it will be for an individual time trial from Foligno to Montefalco, a route only 39.8km in length.